The School of Computer Science at McGill and the McGill Astrophysics and Cosmology Group in the Department of Physics collaborated with the Royal Astronomical Society of Canada Montreal Centre to organize a night-sky observation on July 12 for high-school students attending the School of Computer Science’s 8th annual summer camp. Here, Santiago Lopez of the Royal Astronomical Society peers through one of nine telescopes deployed for the event. The School of Computer Science at McGill and the McGill Astrophysics and Cosmology Group in the Department of Physics collaborated with the Royal Astronomical Society of Canada Montreal Centre to organize a night-sky observation on July 12 for high-school students attending the School of Computer Science’s 8th annual summer camp. Here, Santiago Lopez of the Royal Astronomical Society peers through one of nine telescopes deployed for the event. 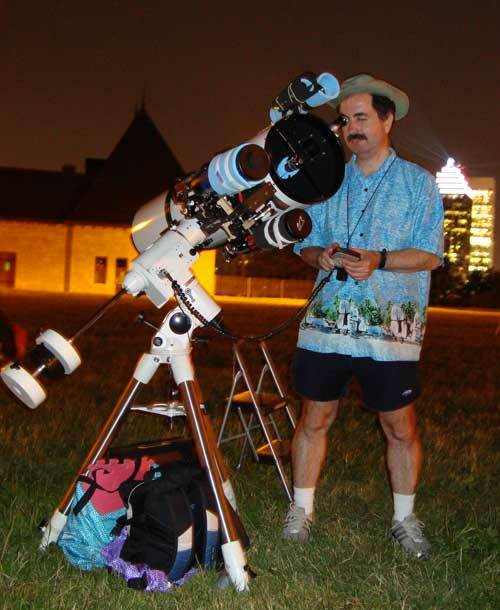 The participants viewed Saturn, Mars, Cat’s Eye Nebula, Brocchi’s Cluster, and double stars, among other objects. A highlight of the night was the viewing of an Iridium flare. Organizers included Ph.D. student Milena Scaccia and Faculty Lecturer Joseph Vybihal of the School of Computer Science and postdoctoral fellow Ryan Lynch of the McGill Astrophysics and Cosmology Group. The goal of the summer camp is to expose high school students to science, particularly computer science and its applications in areas such as artificial intelligence and robots in space, game programming, or medical computing. About 100 students attended this year’s camp, held July 9-13.